I could break down my days by detailing my daily routine, but while that would logically answer the question it wouldn’t capture the spirit. And it’s important to capture Eleuthera’s spirit because that’s what captivates me here and keeps me enthralled. Perhaps Eleuthera’s spirit can best be described in three elements: its history, its beauty, and its people. Eleuthera’s history dates back further than 1648 when Englishmen from Bermuda fled here to find religious freedom. The Arawak Indians and Christopher Columbus’ Spaniards wouldn’t appreciate me starting Eleuthera’s history then. But suffice it to say that Governor’s Harbour as I know it was settled in the mid-1600s. Governor’s Harbour is approximately in the middle of the island and is as charming and picturesque town as I’ve seen anywhere in the Bahamas. Clapboard houses, bougainvillea and a couple of narrow streets cascade down the central hill like frosting on a wedding cake. Once on top of the hill you can see the deep blue Atlantic ocean to the east and the shimmering turquoise Caribbean sea to the west. The sun rises over the Atlantic and sets over the Caribbean and Governor’s Harbour smiles on both of these powerful, awesome color dances. My personal history here is simpler. I started spending my summers here with my stepfather, mother and brother when I was ten. We rented a variety of houses, first at Ten Bay and then, once we realized that the Caribbean side may not be the best place to perch in the summer, we rented houses on the Atlantic side. Our practice of visiting Eleuthera in the off-season continued until I was a young adult and well out of college. Ironically my father and stepmother also came here in the late 1960s and early ‘70s, frequenting the Potlatch Club for two weeks every winter. Although my early involvement with Eleuthera did not have anything to do with that set of parents, their immersion in the island ended up having quite a bit to do with my life here now. Beyond my parents though, most important to me was the constant that Eleuthera provided. I moved to several different cities when I was a kid. I went to four high schools in six years. Different schools and different faces and different friends were my reality nine months out of every year. Coming to Eleuthera was familiar and friendly. Coming to Eleuthera became synonymous with coming home. I could write volumes on Eleuthera’s history—it really is pretty entertaining—but my intent is simply to illustrate my comfort level with the island, my base for happiness. What builds on that base is Eleuthera’s utter, jaw-dropping beauty. There is not a day that passes that I don’t exclaim out loud, “Look at that. That’s just so beautiful!” “That” is most often the water. The water here is ridiculously gorgeous. It is the most vibrant shades of blue and turquoise one can imagine. The colors sneak up on me. I’ll be driving down the Queen’s Highway, the one main road that runs the length of the island, the road will bend and pow-blam-whoop there is a raucous riot of sea color in front me. The water colors are so vibrant and beautiful they make me gasp. The beaches here are lovely too. The sight of a pink sand beach that stretches for miles, framed by verdant green sea grass, palm trees and casuarinas on one side, and the unbelievable blues of the sea on the other, provides a treat for my eyes and mind. One of my favorite moments comes when I watch a small wave crest as it comes ashore. There is sometimes a split second of absolute clarity in such a wave, a clearness that is like a magnifying glass, when it seems I can see the entire ocean floor. Moments such as that are infinitely more valuable to me than man-made ones caught in a movie theater or at a football game. The top of the pyramid that builds on my comfort level here and my appreciation of Eleuthera’s beauty, the apex that makes it all work, are the people. There are many special people here, but overwhelmingly one person in particular makes my days tick. My partner Fred is my best friend and constant companion. We laugh together and live together. Fred met my father and stepmother on the Potlatch Club beach forty years ago, and I feel like I’ve known him that long too. We could have fun anywhere, but his love for Eleuthera equals my love for the island and together we create something stronger. Eleuthera is our rock, and that grey coral creates a strong, beautiful bond. Bahamians are friendly, happy people. As you drive along Queen’s Highway, everyone waves at each passing car. I smile a lot here. Their happiness is contagious. Now too, in season, there are other residents like Fred and me, people who come to live for three or four or five months a year. Without exception these are interesting folks, people who are willing to stake their place on an island without many services. We are all different but we share a common understanding of what it means to be here. We are a patchwork quilt of people spread across the island. As I delight in finding a float or sand dollar on the beach, I delight in venturing out and running into a friend. The people here are the treasures on Eleuthera’s shore. The answer to what I do here is that I move within the rhythm of Eleuthera’s spirit. The spirit moves me, lets me see life in a different light, allows me to escape the frantic materialistic grind that was my life in America. Eleuthera’s informal motto is “Eleuthera: It’s not for everyone”. While I doubt the Bahamas tourism board advertises this, I can vouch for its truthfulness. I do know that Eleuthera is for me. 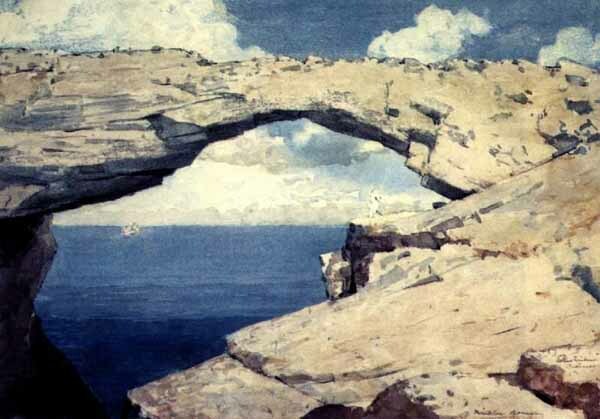 Accompanying Photo: Painting by Winslow Homer, “Glass Windows, Bahamas”, 1885, Eleuthera. Good timing. If the weather is okay between Mississippi and Atlanta tomorrow morning we’ll be arriving GHB for a week’s stay! What a wonderful answer to the unanswerable question. I understand completely. And I am so envious! We’ll be there (from Atlanta) in a week and a half – can’t wait! Thanks, Katie, for a glimpse into your view of my favorite place on Earth. I so encourage Katie to write and when she does, WOW. Katie, you really capture our Island world together so beautifully in this excellent piece. We do both see it but your ability to describe the beauty of Eleuthera and it’s people is exceptional. Keep them coming! Thanks for the update. Your eloquent words make feel as though I was momentarily transported to be with you and enjoy a smile! I do need to meet you. My life too has been anchored by my family and returns to Eleuthera for the last 35 years. Your words captured beautifully the essence of the “home” feeling so many of us have in our hearts for Eleuthera; it’s beauty, it’s people and it’s ability to bring out the best in all of us. Thank you so much. As a side note-there IS a movie theatre in Governor’s Harbour. It does capture a piece of local heritage for me. I have been two times. Once, to actually see a movie. and the second time was to watch the “Eleuthera”s Got Talent” show last summer. I have been in the states for a week now after my winter there. I am already planning my return at the end of May. Enjoy each day! Next time your are on the island, look us up! Regarding the movie theatre, there is the one in Gov Harbour and they have good food, but currently nary a movie in sight. They keep threatening to light up the big screen once again… The “Eleuthera’s Got Talent” show sounds like a blast! Awesome piece. It doesn’t matter exactly what you do when you enjoy the ride. Love you! Thank you for your luminous reflections. Katie, you captured a nice slice of life in Eleuthera. you left out the secret ending to the title which should be “What do you DO, MON?” but if you know how to ask that it means you already know the answer. My longest stay on the island was 6 weeks renting LuLu’s house right on Governor’s Harbour for $12/night. 6 weeks seemed like forever and at the same time not enough. Five months sounds grand and perspective altering. Cheers from London to you and Fred and the potcakes! I met you and Katie’s family while staying at Buena Vista (with Tina) in 1986. You all were renting the Goodman’s house on the beach. Seems like yesterday…not almost 30 years. I’m still in Milwaukee…and on Facebook, LinkedIn. Thank you for transporting me back to Eleuthera! So beautifully written, too! Harold and I miss the island very much.We look forward to seeing you and Fred this summer in Narra.! Enjoyed your post, Katie! Thanks for sharing. Loved your description. There is a whole group of people who were once affiliated with the air force base – some people called it the PanAm base- oe were affiliated with the plantation- who lived on the island in its heyday from the 1950s to the early 1970s. With the advent of the Internet we found each other and have since had several reunions, two of which have been onE.euthera. Have you heard about us? We all share your love of the place and agree that there is a spiritual dynamic on the island that is hard to explain but very real. So nice to read your blog. I hope to get back to the island sometime. Have a great day – oh yeah you’re on Eleuthera – enough said!!!! What a lovely description of that Eleuthera feeling……. just reading it brought on a wave of calm and peace to my spirit! Your blog couldn’t have summed up our feelings better.